Friends, I hope you’ve managed to avoid the stomach flu and colds flying around out there. Sadly, our household seems to be a magnet for it all. I figured since Declan started day care in January that we’d be seeing some sort of kids-share-all-their-germs-and-bring-it-home cold, but whoa. That stomach bug came to us with a vengeance. First Declan got sick, then Mumbles, and then it wiped me out too. And just when I’d gotten good and healthy, I got a cold. It’s been a rough, rough few weeks for us. 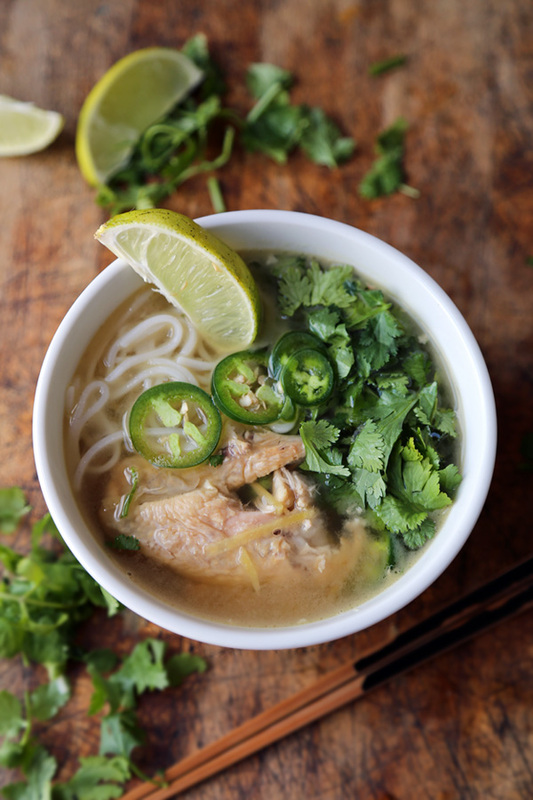 Similar to chicken soup and saltines (my go-to comfort food as a kid) or toast with butter, which my dad always made for me, Mumbles and I have a new family coldbuster comfort food: pho. It’s not a big jump from plain ‘ol chicken soup — but I like that the veggies are more plentiful and fresh and you can choose what goes in it. Conveniently, we have a Pho Company just around the corner from us (I wish it was a darling little hole in the wall, but just as well, I guess, it’s a bright, clean, modern chain) so it’s super easy to call in an order and grab it on the way home or hop in the car and be back on the couch slurping away in no time. Mumbles and I always order extra veggies and we both have a little ritual of using our fingernails to cut the jalapenos into little pieces to drop in our soup (though we have to be extra thorough in washing our hands afterwards so as not to get jalapeno juice in our eyes by accidental rubbing later on — ouch!). Lately, I’ve been ordering chicken and tofu but Mumbles prefers just chicken and I don’t like mushrooms so I steer clear of those. Do you like pho? How do you order yours? I always eat mine with a fork and then a spoon but Mumbles is committed to the chopsticks and full face-in-the-bowl slurping down to the last drop. There’s another clean, bright, modern chain near my work that dubs themselves “the Chipotle of Pho” — you pick the ingredients that they throw in your bowl as you walk down the line. What are your favorite comfort foods and coldbusters? I did manage to catch last week’s episode of The Bachelor but please forgive my silence in regards to recaps. Just for a minute though: who else was totally shocked that Nikki got to meet Camilla already??? WHAT?!?!? Do you think she’s the front runner now? I can’t get over how crazy that was. And, I have an inkling that Clare will be sticking around until the end too. What say you? i love pho too! there were a few places near our apt in SF we could walk to. I miss it here in AZ, but it’s kind of too hot in AZ for pho most of the time. Also Page isn’t the biggest fan of it. i don’t venture too far from pho ga (chicken)- all this tendon or beef ball talk, no thanks. haha! I’m with you on the chicken. And, in fact, after having Declan, my tastes have changed and it’s taking me a while to get back to eating chicken and red meat like I used to. It tastes funny to me now. That’s why I added in the tofu. I sneak some of my chicken into Kevin’s bowl, which he’s happy to accept. Next time you visit (with little Winnie!) we’ll order some in!